I'm very happy to say that this Summer we're doing a pretty good job of ticking things off our North East adventure list. Admittedly it's mostly involved trying all the ice cream parlours but when we're not sat on the seafront at Whitley Bay indulging in yet another Di Meos cone, we are making a definite effort to get ourselves to the places I've been wanting to visit for ages. Our latest great adventure? 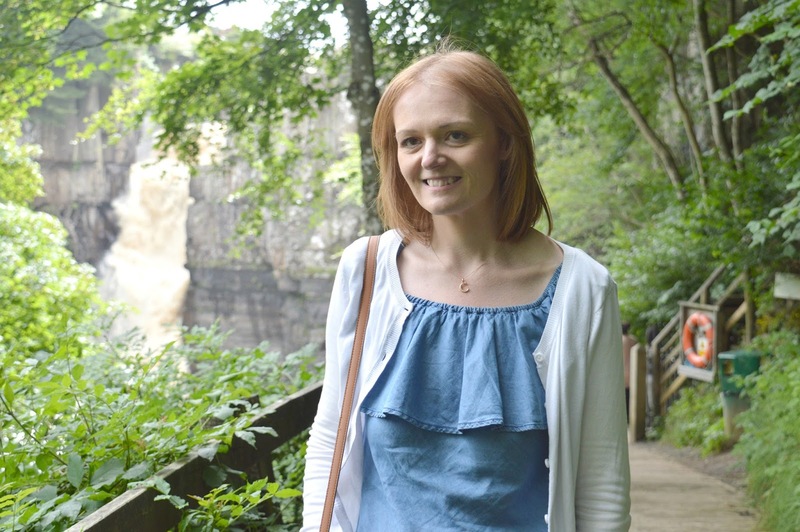 A trip to High Force Waterfall, somewhere that's been on my list to visit since before I moved to Newcastle. 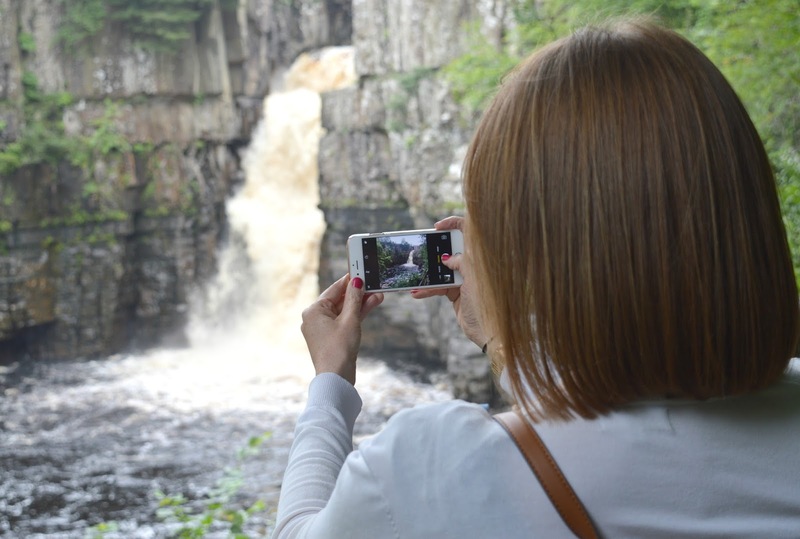 High Force Waterfall lies deep in the County Durham countryside and is one of the most spectacular waterfalls in the country, no surprises it's been on my North East lust list all this time. A bit of a drive from our home in Newcastle, the 75 minute trip was made better by the most stunning views. The North Pennines is an area of the North East I've not heard anyone mention yet it is absolutely stunning. Winding roads surrounded by wild moors, huge hills and plenty of wandering sheep. Simon was cursing me a little as our tiny car struggled to make it up the hills but I barely heard him as my nose was eagerly pressed to the windows, desperate to take in all of the beautiful views. 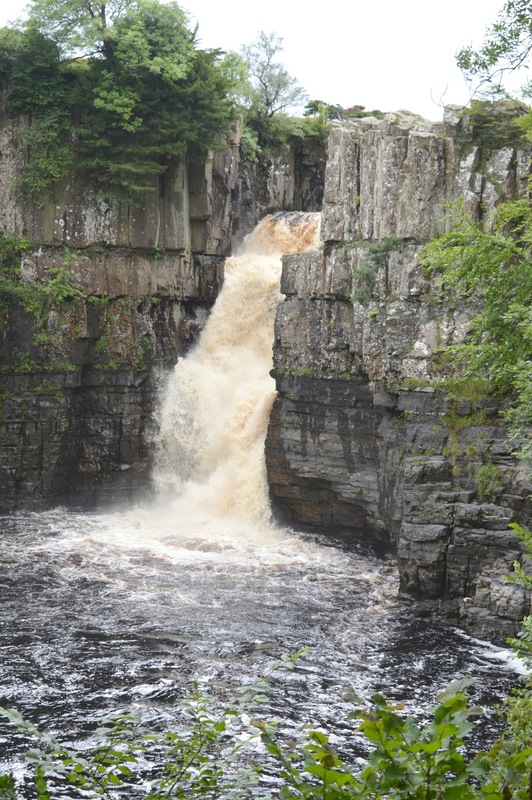 Before we'd even made it to High Force I knew I wanted to return! Having survived the drive without knocking down any sheep (quite an achievement believe me!) 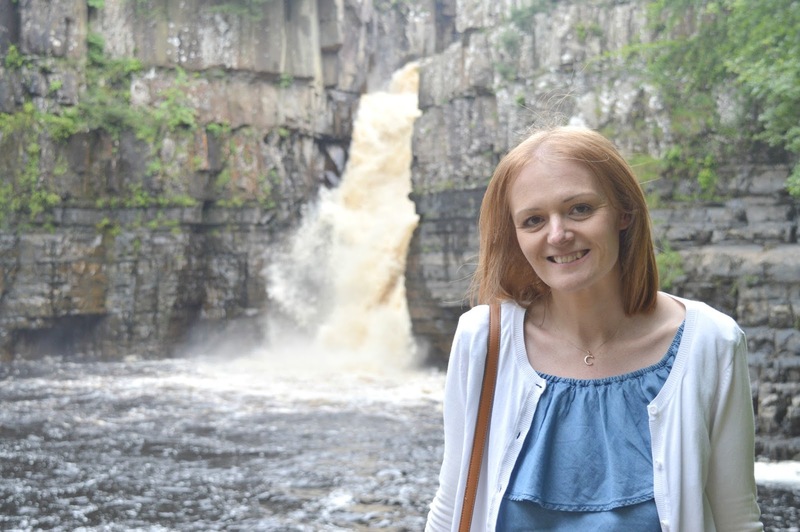 we pulled up at the official High Force Waterfall Carpark, paid our £6.00 admission (£3.00 to park the car and £1.50 each to access the waterfall) and made our way down to the waterfall. With some rather angry looking storm clouds closing in we kept things simple, crossed the road and took the shortest path to the waterfall. Easy to follow and a very short stroll it promised to take us directly to the foot of the waterfall. After a walk through some woodland Simon was the first to spot the waterfall in the distance in what had turned into a "I can see the sea!" type game that I didn't even realise we were playing. He was very smug at having spotted it first and I sought my revenge by taking an extra long time taking lots of photographs. From a distance the waterfall looked pretty impressive and it was so hard to capture it in its glory on my camera. It wasn't long before we'd reached our destination and climbing down a few steps we were near the foot of High Force Waterfall. With the spray of water on our faces (although that could have been rain, I'm still not sure) and the roar of the force in our ears it was a beautiful little spot and would have been quite romantic if it hadn't been for the huge crowds of people all clambering over the rocks to get the perfect views. 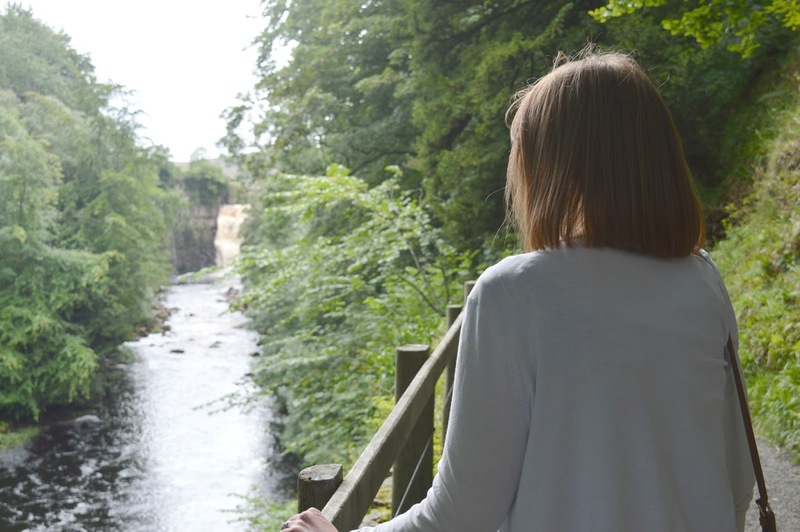 High Force Waterfall definitely isn't the place to go if you want some peace and quiet with your love or fancy perfecting your waterfall photography skills. There were people everywhere! Great for people watching, not so good for appreciating a waterfall. Although it was absolutely beautiful and I was happy to finally see it for myself I'd definitely recommend taking one of the longer walks in the area to get a view of the Waterfall from above where there were fewer people. 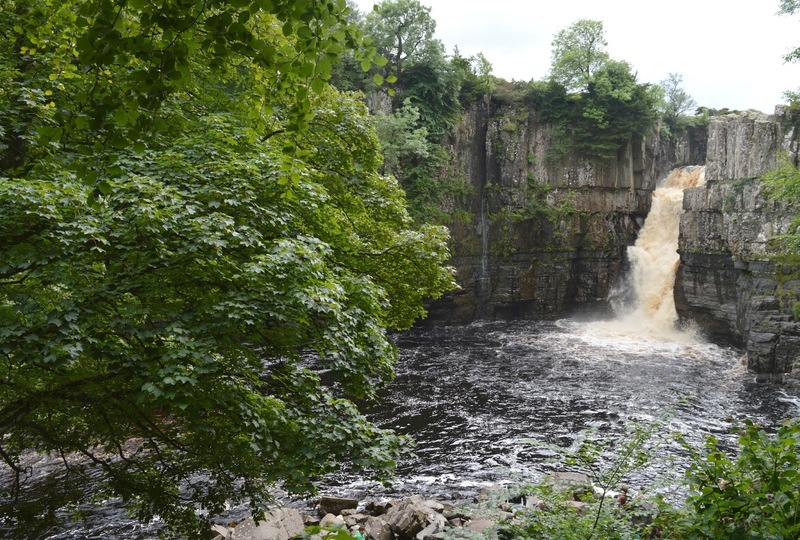 There are several walks that you can do around the area of High Force that include some truly breathtaking views. I left feeling we needed to return and maybe do it a little differently! Another North East adventure ticked off our list at last! 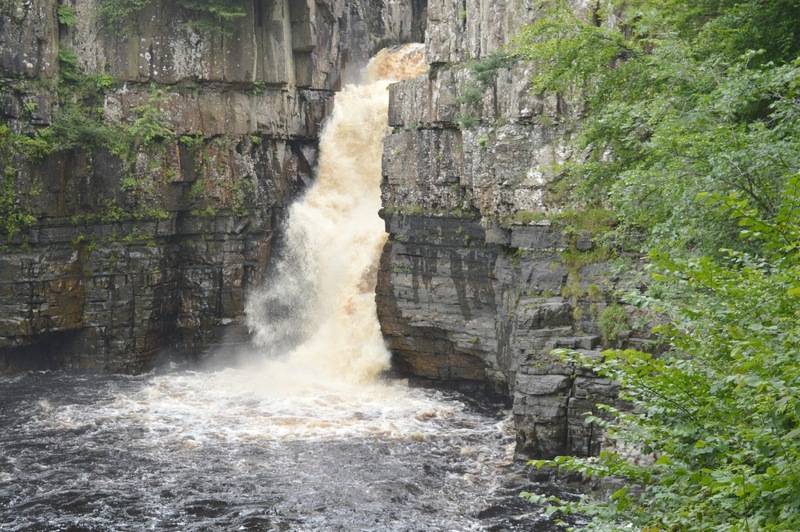 I'd love to know if you've been to High Force Waterfall and if you found it a little crowded or if we were just unlucky? If you have any beautiful walk recommendations we'd also love to hear them. We went there a good few years ago whilst on a camping holiday, staying near Pooley Bridge on Ullswater. I'm pretty sure we've got some photos from above the falls somewhere!